Ways to make your gathering warm and fun! With summer fully in swing and the nation’s birthday coming up in just a few weeks, we can’t imagine a world without fireworks. What better way is there for a backyard pyromaniac to kick off the summer than to do a quick review of Wisconsin state pyrotechnic laws? With this info in mind, we can indulge in that habit with style and safety. Eau Claire is home to some of the best fireworks displays in the Chippewa Valley. There are loads of secret hideouts where you can catch the lights and big booms from the Fourth of July display. You can see the Carson Park fireworks from Half Moon Beach, Lakeview Cemetery, Phoenix Park, and Mt. Simon. Nearby towns that will have fireworks in their Fourth of July shebangs include Altoona, Menomonie, and many others. But you don’t have to wait for Independence Day to enjoy some true blue American fireworks. Create your own fireworks displays with products purchased from licensed local retailers. Action Fireworks & Kites on 33rd Avenue in Eau Claire has a great selection of fireworks to choose from! You just need to remember which ones are legal under state and local law. Consumer fireworks – i.e., fireworks that are specifically allowed for consumer use under 167.10 of the Wisconsin Statutes – are as follows: cylinder fountains, cone fountains, sparklers (not containing magnesium, chlorate, or perchlorate), snakes (not containing mercury), small smoke device, smoke bombs, caps, noise makers, confetti poppers (that contain less than ¼ grain of the explosive mixture), and novelty devices that spin or move on the ground. These colorful and fiery products will wow your barbecue guests and keep all of that fun legal. According to the Eau Claire Code of Ordinances, under Title 9 – Public Peace, Morals & Welfare, fireworks are designated as explosives (9.28). 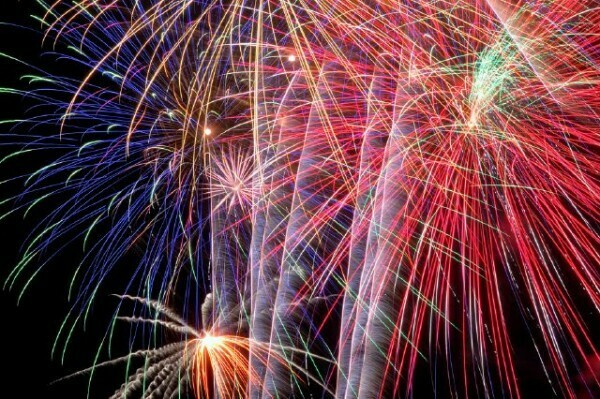 To use any fireworks larger than those previously listed, you must be outside Eau Claire city limits and have a permit. The hard and fast rule for fireworks in the state of Wisconsin is as follows: Anything that shoots up in the air or explodes into the air is illegal. Fireworks liven up a party, but make sure to keep safety in mind. The National Council for Fireworks Safety has a collection of tips to keep firework spectators safe and in possession of all their appendages. • Know your local laws! Know where you can set off fireworks and which ones you can use. • Read the firework labels closely, know how they will act once lit. • Only adults should be permitted to light fireworks: children should never handle explosives. • Avoid drinking alcohol while handling fireworks. • Keep your pets safe, too! Avoid bringing them to fireworks displays. Exposure to the sound can cause hearing damage and many of our furry and feathered friends are afraid or anxious around loud noises or fiery displays. Visit the National Council on Firework Safety website, fireworks www.safety.org, or the National Fire Protection Association website, www.nfpa.org, for more information and additional safety tips.